In as much as one can get 12 months into 4 minutes! My hours in the logbook this year don’t entirely represent the flying done – I spent a lot of time at the beginning of the year chasing paperwork and instructors around the place to sort out flying the micro on a JAA PPL. 17 hours, 10 minutes, 24 flights, across 19 days is the paper tally of hours and minutes but the actually handling time must be double that even ignoring the larking about as Nick’s passenger. It doesn’t reflect all the occasions the day’s work was followed immediately by rushing off to the airfield of the one glorious summer week when I flew every single day or the experience gained by the first outlanding due to weather or all the times we flew ‘just once more’ as the sun set. And most of that 17:10 in the book was flown after July when I finally got signed off. If I fly as much next year it’ll be upwards of 30 hours again for the first time since 2009. It was interesting to bung the figures on the graph since it was about this time in 2004 that I started learning. Halfway through 2006 was when I qualified so that high point there is a mix of all the long training cross countries and the flying and flying and flying of TOMS having bought the share a few weeks before my GFT! A couple of very wet summers meant I never quite topped that! 2009 was boosted by a tour of Devon and some Irish flights and lots of fly-ins and closed with the engine replacement. 2010 was wet and closed with someone stuffing the poor old girl into the side of a mountain, new engine and all. 2011 was a disaster, scraping along with a poorly thought through replacement which was an utter money pit and a vague attempt at giving the IMC rating a go. 2012 I started thinking seriously about how to stop the rapid decline! 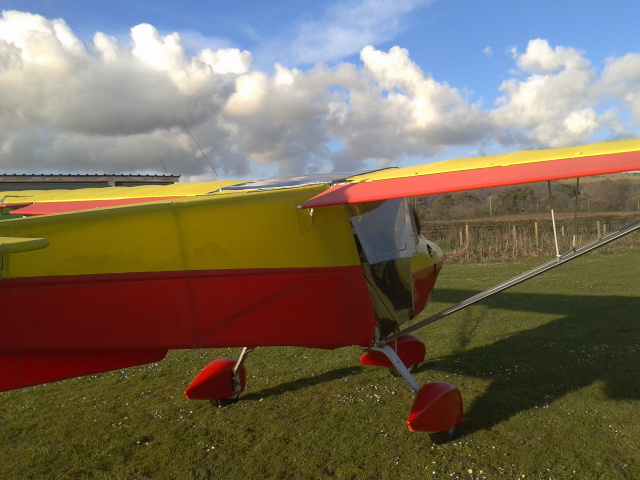 I did tailwheel in an attempt to broaden the range of types I could look at and at the end of the year was tipped out that this little X’Air was for sale but really the owner didn’t want to sell it and would probably be open to sharing. Interesting the trend is more pronounced if I look at number of flights as well as hours. Either way, things are looking up! To close here’s the slower version of the last year’s flying. This entry was posted in Wurbles on 7 January, 2014 by Leia. So the stator turned out to have a coil which had coughed and died. One excursion to Lincoln later (plus an afternoon of exhaust sanding and painting and prop pitch resetting while we were at it) and an afternoon of refitting the engine we were good to go again. This is rather different to the way it was done in Group-A-land and I think I already know this engine and airframe better after five months than I knew the workings of the Lycoming after five years. There’s a lot to be said for being able to do so much of the work yourself. Changing the stator was off over the horizon of our knowledge but stripping and preparing the engine and refitting it, that we did ourselves. A lovely evening flight to check all was in order (not quite – oil from the rebuild everywhere from an exhaust gasket and a sticky mist from an overfilled radiator – both quickly resolved) and we were ready for a trip. The following week I’d planned to catch a train down West to my mum’s Birthday BBQ, but a sunny morning and Nick at a loose end quickly changed the plan to flying down to Rosemarket. Sunny it might have been but it hadn’t come alone and the westerly wind was extremely flustery, snatching at us over the trees as we took off and knocking the groundspeed back to a miserly 41knots in the cruise. It swung around to blow from the coast as we passed Pembrey which helped a bit and we came down lower to take advantage of the reduced headwind, gaining a princely 6 knots more. Thermals added their own contribution to the ride with Rhubarb doing a creditable impersonation of a glider at one point with 500fpm climb on the VSI. Another Old Park flyer had preceded us to Rosemarket so we were expected, and a fast, tight go-around revealed an assortment of family members standing at the edge of the grass! Trying (slightly in vain) to avoid the puddles, we taxyed in and were greeted, immediately on engine shutdown, by the wall of noise that is my three nephews. The youngest at almost two already includes the words “Take Off!” in his fledgling vocabulary and the older two were trying to climb in almost before we’d climbed out! I think they think everyone’s Aunty flies little aeroplanes, they confidently assume the whole aircraft is up for grabs in the same way the stomp rockets or paper gliders I sometimes bring home are! “Neowm!” annouced the smallest nephew. “That’s how a jet goes. '” observed another. “Yes, Rhubarb doesn’t quite go ‘neowm'” I admitted. “More like ‘Wwwwhhheeeehhhh!” I said, without thinking, causing my sister to have a fit of the giggles and the oldest nephew to spend the rest of the afternoon mimicing a two-stroke at full blat. Taxi-of-mum ran Nick to the petrol station for a jerrycan of fuel to replace that guzzled by the headwind while the boys ran up and down on the grass pretending to be microlights themselves, and the littlest of the bunch, my baby niece, kicked and gurgled in my brother’s arms not quite big enough yet to get in on the action as she’d like to! Nick returned, refuelled and took off into what must have seemed like blissful silence in spite of ‘Wwhheeeehhh’ and we bundled into cars for ‘Nana’s House’. The following weekend saw me spend Saturday digging a way out of our hangar… We should have gone up not down to level the ground with 20:20 hindsight but there’s too much up now to change! The evening was spent shooting approaches into the strip – I think I’ve got myself more or less tuned into it now. Unfortunately another mishap (not mine!) the following morning saw the repair duties lined up once again and I was back on the train for the Belle Vue scout camp to take my mine off matters! 24 Scouts across two days an assortment of aeroplanes and 3 badges each is enough to keep the mind fully engaged and it was, as always a delight! This entry was posted in Flights, Wurbles on 5 June, 2013 by Leia. The morning was warm, the wind less than ten knots though varying in direction, the strip awash with people and aeroplanes and cars looking for space. Best of all I finally had an instructor lined up – said instructor in fact being the chap whose name and squiggle appears on the cover page of the POH for the X’Air! The sheep were out again and I joined the effort to relocate them – they’d gone both under and over the allegedly-electric fence this time! Never mind giving me the eyeballs you – just get off the blooming runway! It was interesting to do the walkaround of the aircraft with someone who knew the type so well and I learned a few extra details and things to check (vent on the back of the fuel pump, and the fact the tyre pressure is actually part of the mechanics of the suspension). It was also interesting to hear some of the changes made to the X’Air to satisfy the BMAA once they started being imported (and that just after the introduction of Section S). The jury strut horizontally between the two main struts is a British addition to increase the tolerance to negative G, but it then interfered with the natural twist of the wing in flight (which used to cause a sort of natural washout), which made it somewhat unstable in pitch. That was compensated for by adding a bit of reflex to the ailerons which as a side effect added 5 knots to the cruise airspeed… Fascinating display of engineering knock-on effects! I went first, with Guy flying the first 20 minutes or so to discover any particular foibles of Rhubarb as opposed to any other X’Air. (She does have a few we discovered – dropping the left wing consistently in when stalled in certain configurations of flap and power). Then we started on the training proper. Stalls I hadn’t really done but are so startlingly undramatic that they weren’t too challenging – she really will just sit there with full back stick wallowing about and sinking but not really doing much of anything else at all. Back at the strip my main offence was not getting setup and trimmed early enough to have a stable approach. This usually (and yes I’m acutely aware it’s an repeat offence!) 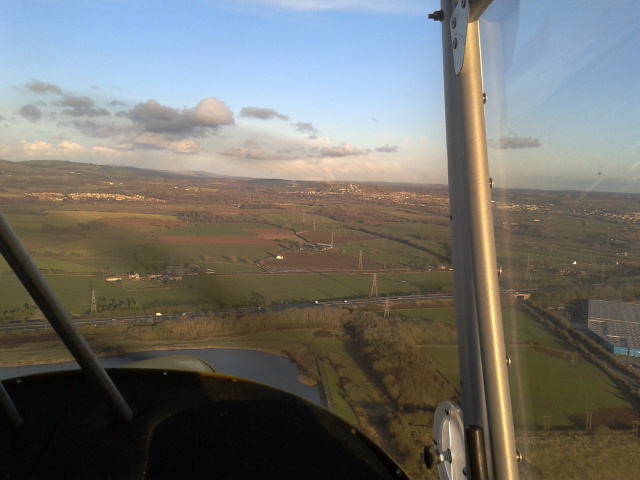 ended with me being high and fast and/or well off the centreline. Neither landing we did was as neat as my attempt the previous week annoyingly. I was also picked up on an non-aircraft-specific issue of lookout – a useful reminder of why it’s a good idea to have an instructor along occasionally regardless of specific training needs. When concentrating on something else lookout is one of the things that does tend to go by the by. It was after another cuppa we hit the snag of the day. I’d started up, on second attempt – after a bit of experimenting with choke and throttle for the warm-to-hot-ish state of the engine, and was doing the checks when on the left mag cough splutter I gave Guy a startled glance. I repeated the checks on both leaving it a bit longer with on off (I have been guilty in the past of just flicking them rather than waiting to see what the drop actually is) and this time on the left it was cough splutter dead. “That needs a look then.” I switched everything off and clambered out. Nick headed to the car for the toolbox and we talked through the problem. Spark plugs came out and, though looked visually fine, were swapped over. Same issue. More discussion and I learned that what I’ve been thinking of, and calling, “left mag / right mag” are actually part of an electronic ignition system known as DCDI (Dual Capacitor Discharge Ignition). Two CDI units fire two spark plugs each, one in each of the two cylinders. They’re positioned front and back and no one knew which left/right switch was front and back so the next step was pulling leads of and trying it with the upshot that the final diagnosis was either the frontmost CDI had popped it’s clogs or that the associated wiring had. Wiring is cheaper – that first! But tracing cables is slow so with regret we said goodbye to the instructor, cursed our luck to have a tech problem on the best flying day of the year so far and pushed the aircraft back to her spot to investigate further. And there perhaps we’ve found the problem – some distinctly underspec crimping in the connectors from the engine to the airframe / instruments was in evidence. At least one cable was finger loose and pulled from its connector. Two more actively fell from their connectors as we pulled at cables to move things to a workable position. This entry was posted in Flights, Wurbles on 21 April, 2013 by Leia. Having pegged out the hangar plan (with such ‘success’ that I used it as an example on the work blog to my learners of a real life project! ), I was occupied those same learners as the upright went up courtesy of Nick and Clive but back in the thick of it for the start of the levelling. We were going to leave this until later but discovered that in our new spot further down the hill, where it’s steeper, it’s become a complete sod to move the aircraft with fewer than two people as she fights to roll back down into the hedge and/or sit on her tail. This wasn’t much of a problem until the uprights went in which, since we are effectively building on the spot we’re parked on made every movement a right peril to the wingtips. So a level inside and bit of flat standing outside is called for to make moving around by hand on the ground less hairy. Saturday was forecast with dry spell so we began… To my mild surprise it was only a six inch difference across the width of the middle section of the interior from top to bottom. We got it maybe half done before the heavens opened! Meanwhile in one of the dry windows Nick had swapped the carb rubbers on the engine and flown a brief test flight before the downpour so the aircraft and covers were soaked too. Urgghh. 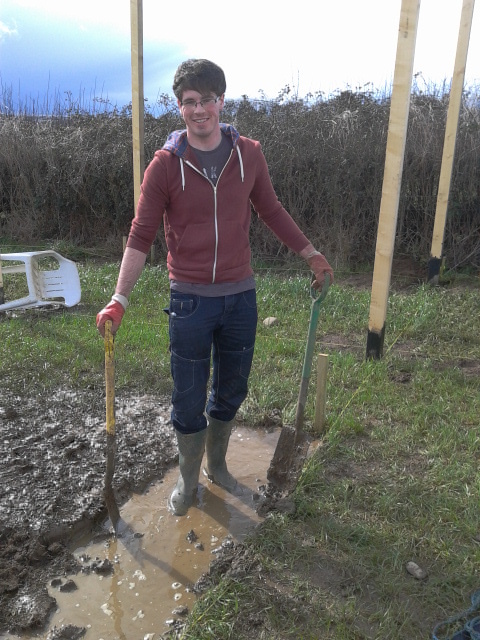 We put everything away as best we could (during which I fell straight into a waterfilled posthole up to my knees!) and dripped our way home! 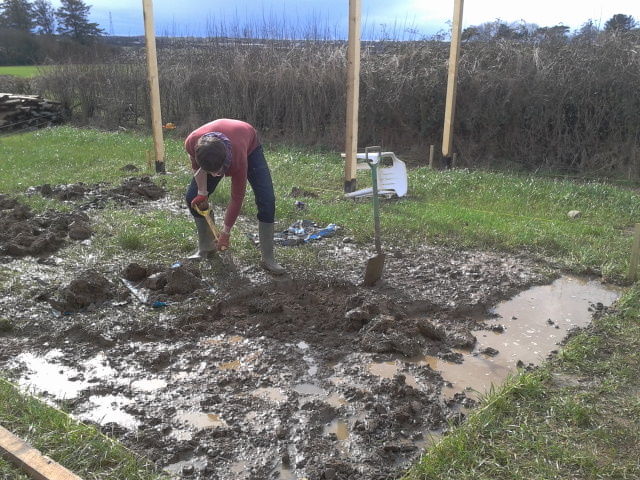 Sunday was glorious weather-wise but with the ground still sodden we gave digging a miss. I was prompted by the outbreak of spring to dust off, re-oil and fettle the pushbike and try out the alternative route to the strip (Train to Pyle then mostly cycle path). Good grief I’m unfit! Being a little folding number, the bike’s not exactly built for the farmyard either but freewheeling down the hill to the parking spot was fun! I peeled off the damp covers and spread everything out on the grass to dry before mopping water out of the various places it had gathered even inside the cockpit. Satisfied I’d done as much as possible to dry things out I left Rhubarb basking in the sun and wandered in search of company for a cuppa. 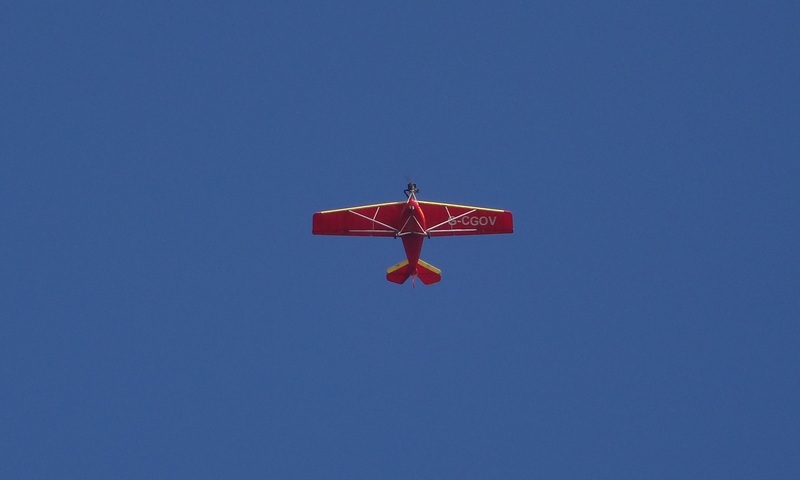 Several people were up and flying, and John arrived back in his Skyranger with his 90+ uncle along – who prompted impressed the life out of me by explained what he was going to do with all the photos he’d taken in Photoshop! John got the kettle on and after another cuppa suggested a flit in the SKyranger. 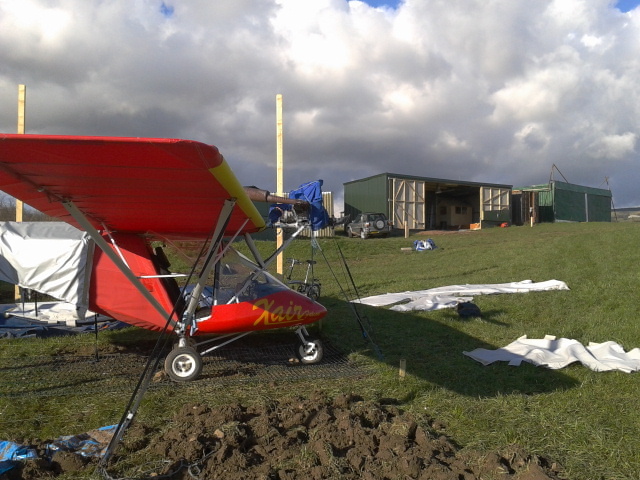 I’d not flown the type before and never turn down flying in any case so he prepped while I scuttled up the hill to re-hoist the windsock. Maybe I’m just used to Rhubarb now, or perhaps my legs are getter shorter but it seemed a bit scrabbly hop to climb up into the Skyranger. I went through me usual massive shortening of harness while John started up. It doesn’t hang about, that aeroplane of his! Bit heavier than Rhubarb but with a 912 up front we surely didn’t use any more runway and the rate of climb pipped us too! We stooged about a while, before John demonstrated his alternative approach into the strip, keeping close and tight inside the wires. 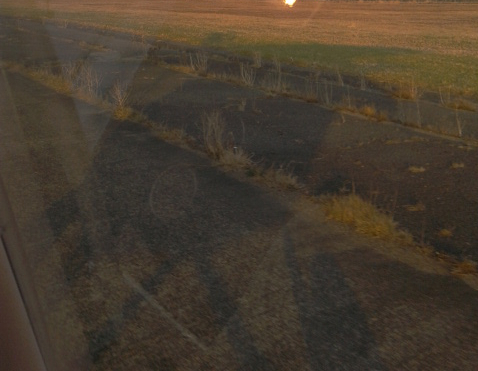 Neat, and so very quick to stop on landing. After the next landing John suggested we swap places for me to have a fly so a quick changeover on the ground and away we went again. Trusting chap, given I haven’t even landed the X’Air at the strip all that often or without Nick following through. Like the X’Air the main thing that caught be out and needed prompting or a nudge was quite how quickly the speed goes away on taking the power off. First attempt was tidy-ish, second less so, but nothing to alarming! Good stuff, but fuel was coming to the end of what was sensible and it was time to put things to bed. 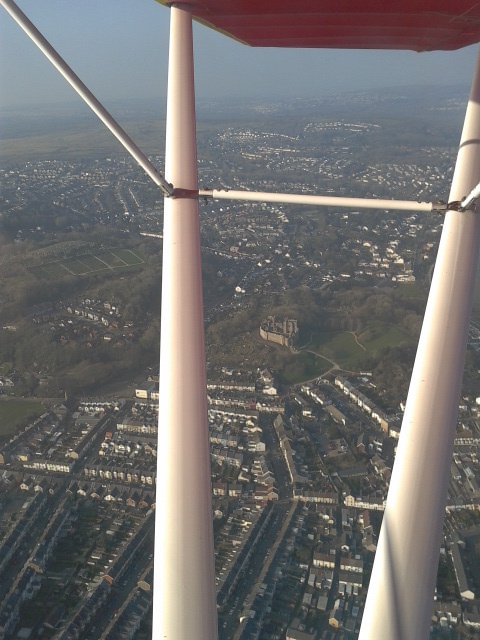 Lovely day – lazy but passed off as productive and got some flying in… Very typical of the pace of life at Old Park! This entry was posted in Flights, Wurbles on 19 March, 2013 by Leia. For the first time in far too long I’ve been slow updating here not for lack for flying but for an excess! Early darkness and murky vis have kept most of the flits local and I’ve still to pin down an instructor for the differences sign off but most weekends have involved at least a brief escape from the ground. A combination of weather, availability and and schools’ apparent business model of prioritising regular ab initio students’ timetabling over ad hoc training reached it’s most frustrating point on Saturday morning with another cancellation on the best flying day for weeks. I was soothed though by a winter-rare land-away to visit the newly reopened cafe at Swansea (Go!) where everyone was in very good spirits and feeling positive. 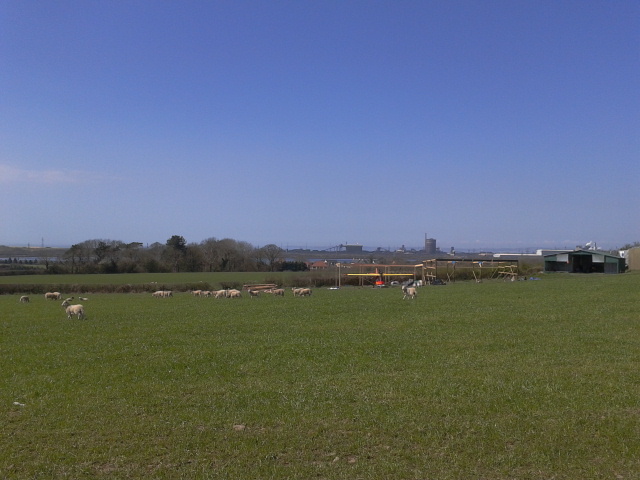 Prettiest castle on Gower between the struts! I landed on the ample runway, firmly but not badly and am starting to incline to the point of view put forward by a number of people that I should forget the training stage – practise landing with anyone who knows the aircraft and’ll sit with me, instructor or no, and then just get an examiner in once I feel confident. Wavering between caution and frustration I still don’t know if that’s the best plan or not. It was refreshing to land away though, albeit only the next airport over – We ere recognised and snapped on the way home too! On the way back we met up with a flexwing from the strip and had a bit of companionable flying around the beach! Meanwhile, back on the ground we’ve started on hangar building – under the direction of Clive the most organised of the group! 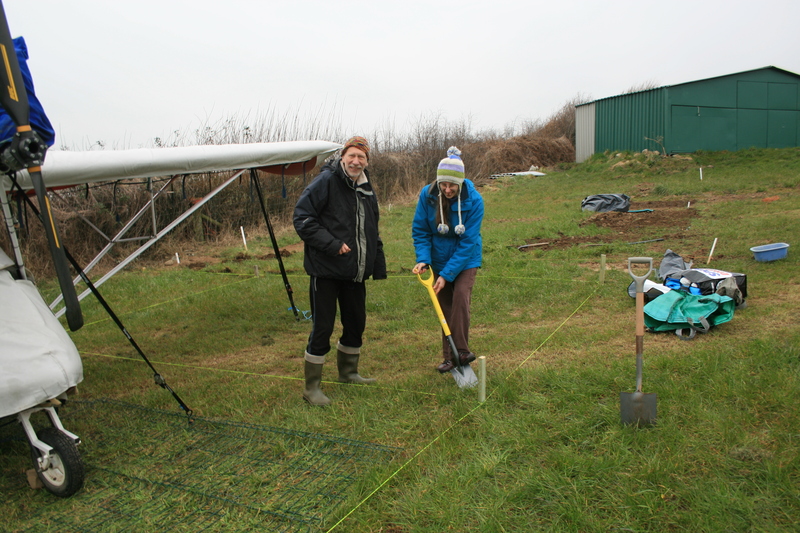 We arrived full of good intentions to put post holes in, new spade and all, to discover that the even more organiser builder of the next hangar over was renting a hole making device that would vastly speed the process up. We agreed to share it and bailed on the digging at once! I went for a walk up Graig Fawr instead, and spent the next flight looking for the little ruined church I’d ‘discovered’ on the way – only to be thoroughly dismayed that it wasn’t nearly as far up the hill as I’d imagined slogging up there! This entry was posted in Flights, Wurbles on 3 March, 2013 by Leia.